Ever since we took Rilyn to her first Aggie football game in the fall, (and we were playing t.u. ), she has been very sensitive to the Longhorn symbol. Whenever she sees it, (which is a lot in Austin! ), she always has to make a comment about how she doesn’t like the Longhorns. We are trying to teach her that Longhorns can be our friends too. We just don’t want them to win when we are playing them! 🙂 (And later we will teach her how we really don’t ever like them winning at sports!) 😉 So this week in kindergarten, Rilyn had to measure different Texas ‘symbols’ for math. Her packet included things like a boot, a cactus, the flag, the state, the Alamo, etc. The one thing she didn’t want to see though, was a longhorn. 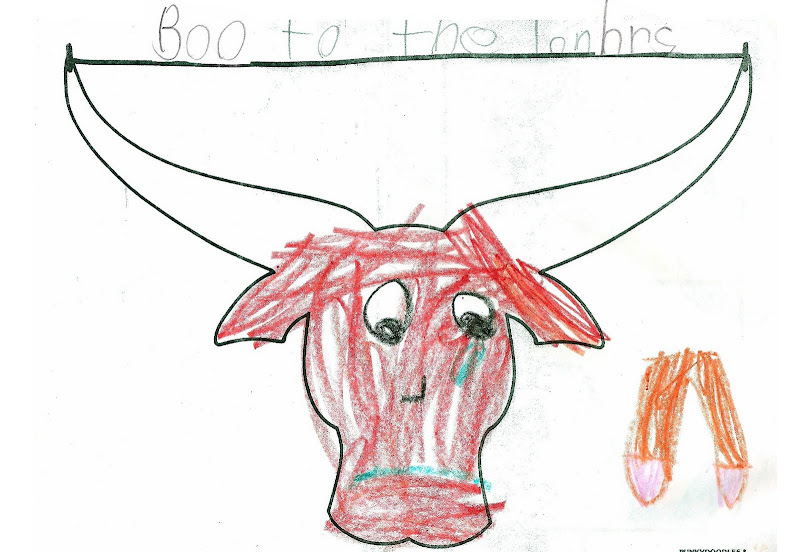 So she took it upon herself to make a sad face longhorn complete with a tear in his eye and wrote a declaration of her thoughts: Boo to the longhorns. Oh, and the pair of pants looking thing in the right corner? When I asked her, she said that was her two fingers pointing downward saying boo! The black line across the horns is where she was supposed to measure the distance.